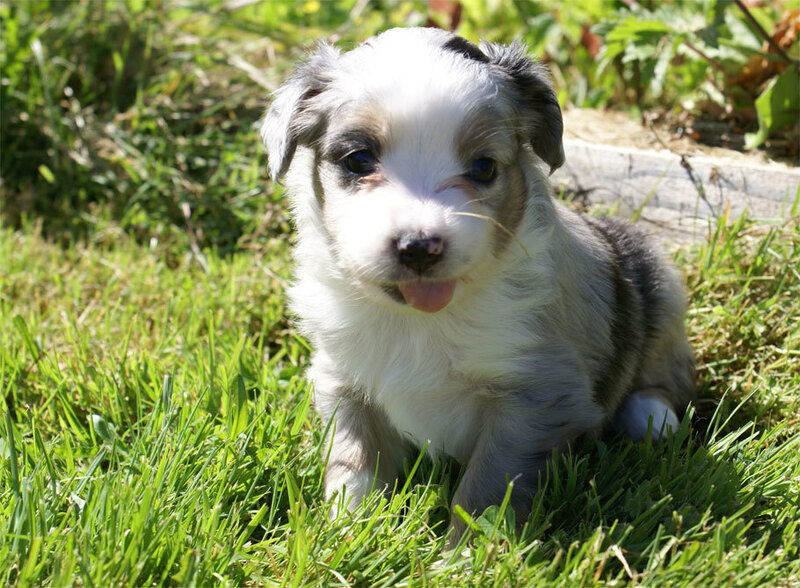 Available Mini Aussie puppies from August 2009 at Breezemore's Maine Miniature Australian Shepherds. 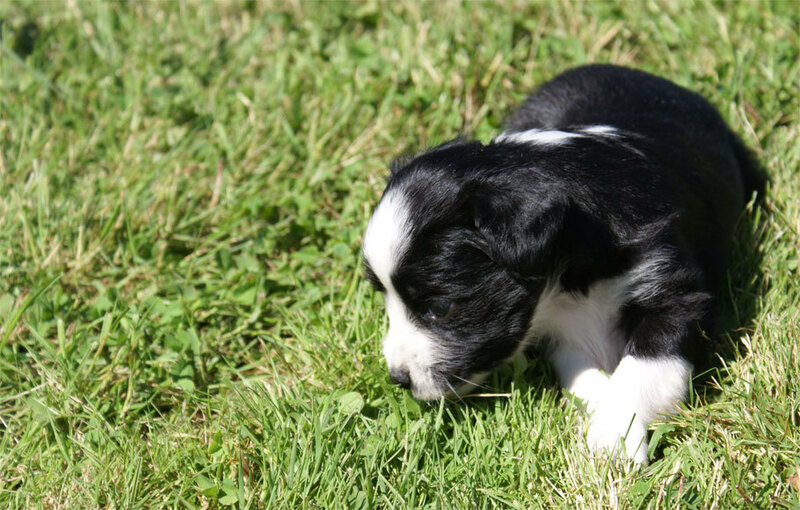 August 2009: New Miniature Australian Shepherd Puppies! Jazzy and Eli had a new litter of eight puppies (2 males and 6 females) on August 10th. As always, these puppies are eligible for N.S.D.R registration. You can e-mail me at breezemore@gmail.com for more information, questions or pictures. A copy of our puppy contract can be downloaded here. She may have 1/2 a blue eye. Really sweet pup, she is quiet but enjoys interacting with people; she loves to be held. She assesses the situation, and once she's figure it all out, then she comes out to play. Sold, Thank-you Caitlin. She has named her Marley! She has a full white collar with bright copper trim. She may be a smaller mini. She is outgoing and is always read to play. Sold, Thank-you Quynn and Jim. They have named her Lucy! She is a darker red merle with nice copper trim and brilliant blue eyes. She's a square pup with a nice short muzzle. She loves to be held and snuggle. Sold, Thank-you Jordan. She has named her Alice! She is petite but well proportioned; she may be a small mini. She is enjoying interacting with people. Sold, Thank-you Alexanders. They've named her Mya! She has unique merling with a full white collar and is showing some copper trim. She is full of kisses like dad (Eli) and loves to play hard. She's a headstrong Aussie pup without a doubt. Sold, Thank-you Dave. He's named her Zoe! She has no copper trim and is starting to show spotting on her feet like mom (Jazz). She loves to play and interact. Sold, Thank-you Suzanne and Dave. They've named her Razz! He is the biggest of the pupes and loves to be held and give puppy kisses. With puppy breath. Sold, Thank-you Marggraf Family. They've named him Oakley! He has nice copper trim coming in. He is very outgoing and is always ready to mug for the camera. Sold, Thank-you Browns. They've named him Tucker!